← Malus “Admiration” – an impulse buy. 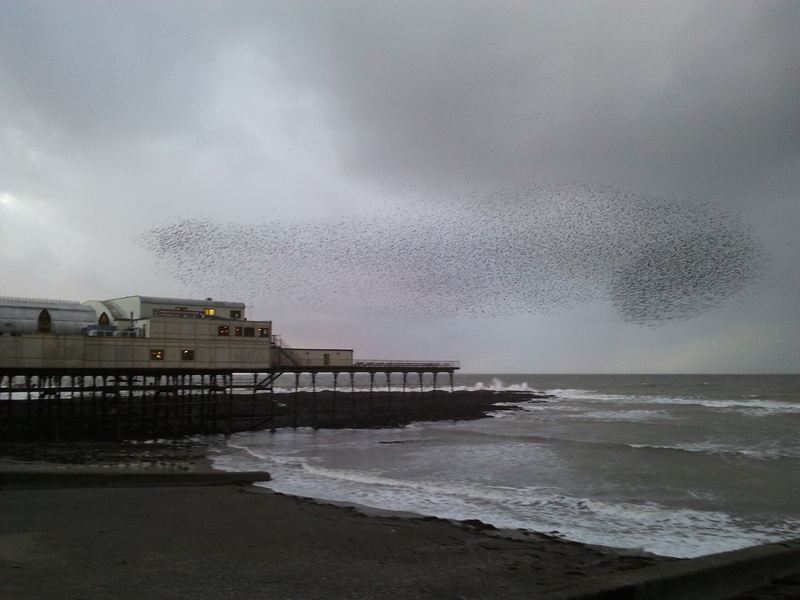 When we received a text asking if we fancied a trip to Aberystwyth to see the murmuration of starlings at the pier we didn’t need asking twice. This was a chance to see one of the UK’s most incredible wildlife spectacles. We had experienced small murmurations in Northumberland when we watched hundreds of starlings grouped together to roost in a clump of tall coniferous trees. That impressed us – the Welsh murmuration should amaze us! After a long drive of nearly 3 hours we arrived just before the expected start time of 3:30 and found a parking space just 50 yards from the stage – the pier. Apparently they are very accurate time keepers these starlings. It was dull with heavy deep grey cloud overhead and it started to spit with rain. The skies above the pier were quiet so we decided we had time for a coffee and buttie. After that long drive which found us stuck behind everyone who didn’t seem very keen on getting to their destination so drove at 30mph, I was desperate for a coffee and so were my three companions. We poured the coffee out and each of managed a bite of s buttie before the spectacular crept up on us. First a small flock of a dozen or so starlings, a few minutes later a nother small flock. 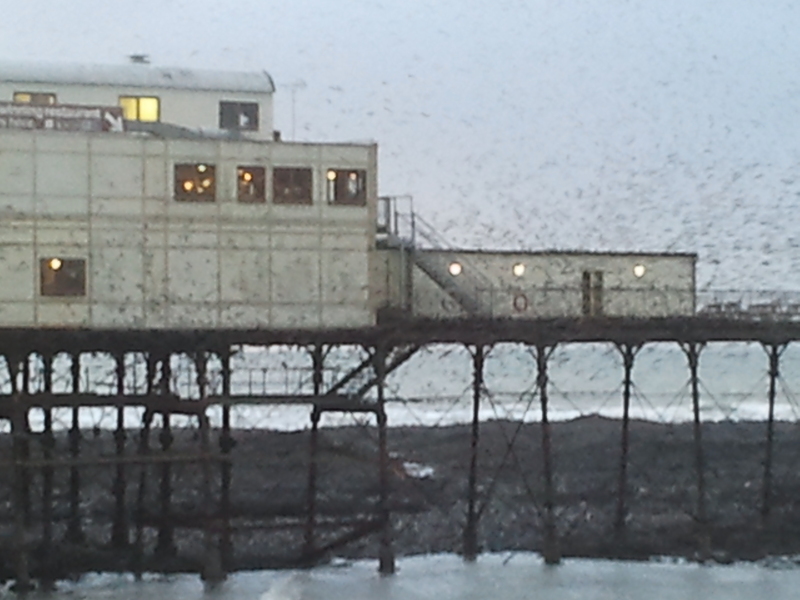 But suddenly flocks of every size and odd individual bird wer homing in on Aberystwyth pier. We jumped from the car coffees in one hand butties in the other. these were soon dumped on a bench as we grabbed binoculars and smart phones (for their cameras). 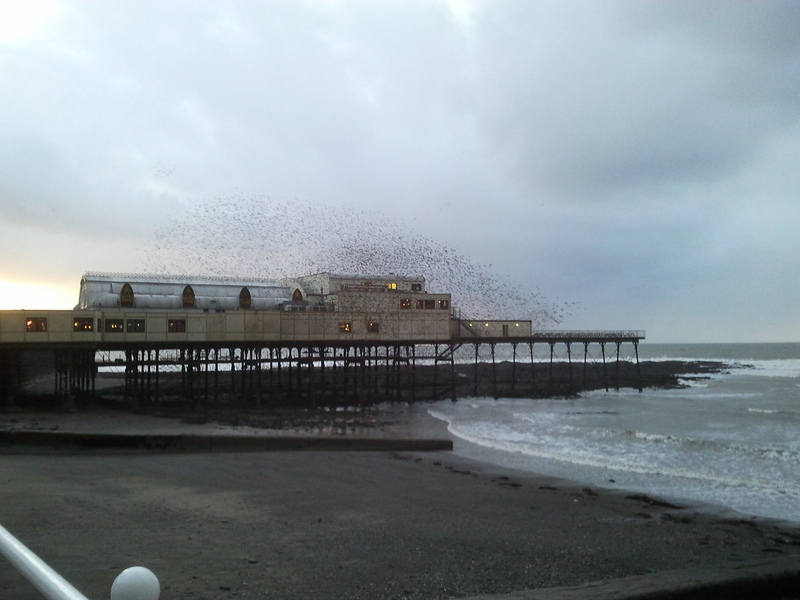 Then all hell broke loose as starlings in flocks of all sizes arrived from all directions and at every angle some over the roofs of the town some over the line of sea and beach. In the end the skies overhead were patterned by tens of thousands of little black birds all trying to communicate at the same time. As the flocks merged they created smoke like patterns moving in harmony. Choreographed by social understanding, these dark bird clouds moulded into ever-changing shapes, soft curved shapes. An aerial dance of waves. Some birds had traveled from 20 miles or so away but every single one had time to dance. They entertained us. They enthralled us. 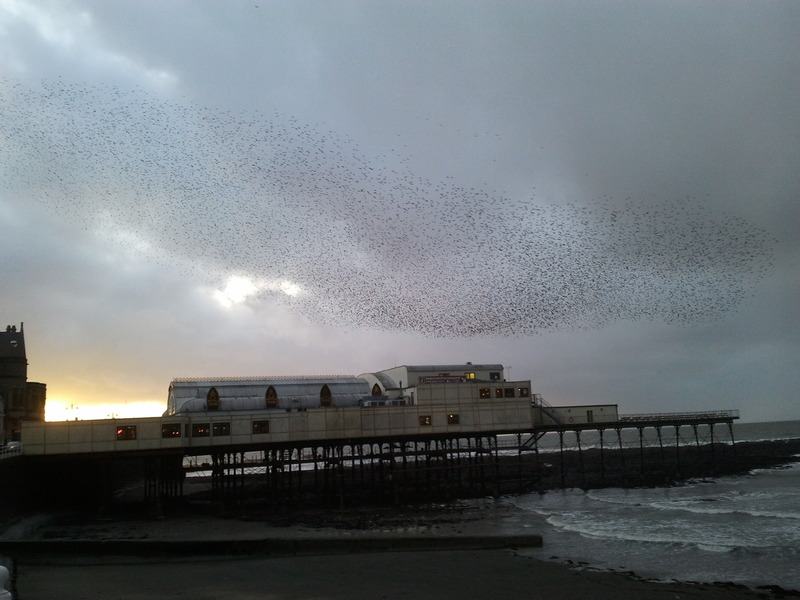 The sky was simply full of starlings all awaiting that time when the group decision was made to drop down and settle for a night under the pier, on every beam and bar. They dropped like closing blinds. Chose good spots safe from predators, sharing each others warm and news of the day’s foraging. Their talking is deafening like an ill-disciplined school dining hall on a wet and windy day. They repeat this performance every day. They know the pier affords them good visibility and a feeling of safety. As the tide rolls in the sea adds further protection and drowns out their chatter. They have once again found the security of their communal night-time shelter. As the last small flocks found spaces under the pier the gentle rain turned heavy and we retreated to the cover of the car. As we drove home high on the spectacle we kept wondering why these gatherings were called murmurations. A murmuration is simply the name for a group of starlings. The dictionary definition is “a flock of starlings” or “an act or instance of murmuring” – no help really. So we don’t have an answer and neither does anyone else seem to. Let’s just be satisfied with the memory of seeing this one at the pier. It is hard to comprehend that the status of the starling in the UK is Red Status as these gathering give such a false impression. The majority of the starlings in these roosts come from the European continent. Perhaps the publicity given on TV through Autumn Watch and through the many video clips on the internet we may become more concerned and determined to do something about their falling numbers. We try to do our bit by encouraging them to the feeding stations in our garden where they gorge on suet blocks and fat balls. The big picture is hard to comprehend – if farming methods and the related food shortages are to blame then some big changes in the way Britain produces its food is called for. Those who make decisions about our farming need to display great strength of mind and a strong will. We can but hope! This entry was posted in birds, conservation, garden wildlife, RSPB, wildlife and tagged murmurations, starlings. Bookmark the permalink.